Matcha and Vanilla Tart - Do You Know The Muffin Man? 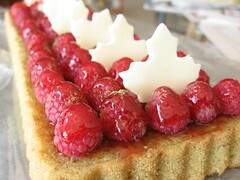 Notes: A Google search led me to this financier recipe which I thought would be a nice dessert for Canada Day. I only had 8 egg whites, so I made four-fifths of the recipe. After mixing the egg whites, confectioner's sugar and almonds together, the batter was lumpy so I used a hand blender to get out the lumps. 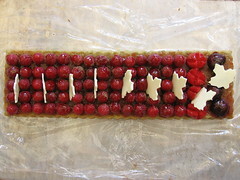 I poured the batter into one 35×11 cm rectangular tin and three 10 cm round tart molds. The cakes rose quite a bit to form domes; after cooling, I sliced the tops off to make a flat base. I brushed melted red currant jelly on the surface, then arranged Ontario fruit (fresh from the farmer's market) on the top. Using a mini leaf-shaped cookie cutter, I made some white chocolate leaves as a garnish. 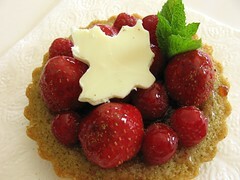 This cake is nicely scented with vanilla, not too strong green tea, and has a nice contrast from the tart berries. It's a little dense, but maybe I overmixed the batter.